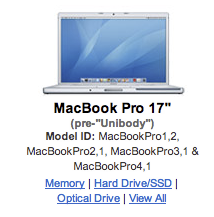 Recently I did an upgrade of my Apple MacBook Pro 2.33GHz (17-inch Intel Core 2 Duo) - Late 2006. I went from 100Gb to 1Tb. I thought I should document it since I forget quickly and may have to do this some time later. Also, I'm hoping it helps others out if they are going the same thing. I bought my upgrade hardware from OtherWorldComputing since they have an easy upgrade and product identification process for finding what works with your computer (the My OWC tab). OWC also has well put together videos and instructions for the complete upgrade process, from taking apart the computer and installing it, to the software used to upgrade. Once I had my new hd kit, I had to install the new hd into the external hd enclosure so I could clone my current hard drive onto the new blank hd. I used Carbon Copy Cloner to do this. It's free and works easily and perfectly. Once I had a copy of my Mac OS on the new drive I could remove the old and install the new. Per OWCs installation videos, I opened up my laptop with the provided tools from the kit and took out the old hd. Then just plugged in the new one, remounted all the brackets and screws and closed it back up. Powered back on and wolla! After I received my parts, on the OWC site I clicked on the upper tab for Customer Service, then went to the Installation Videos, scrolled down to my computer and clicked the hard drive install video. Install old hd into the external enclosure, so I can get back my original partition too. You could have done this with the old hd in the laptop too. We just have to make an image using WinClone so we can put it back on to our new drive. I use Bootcamp to run a Windows partition on my Mac, thus a major issue with only having a 100Gb drive. I was out of room and couldn't install any new software or really store files on my old hd since I had only half the 100Gb to work with. Step 4: If I remember this right, I booted up my laptop, then created a new partition using the BootCamp app that came with the original Mac OS. Once I had a partition, I just double clicked on my WinClone image that I made using Winclone. It doesn't really matter if make the WinClone image while your old drive is in the laptop or new external enclosure. Might be better to do it before though. Basically it just restores the image you created to that partition. Also, this worked perfect for me too. Here's my MacBook Pro while I had it apart. I also had to change out my right side fan that decided to start squeaking. I originally tried to fix it, and it wasn't so noticeable, but really was loud still so I replaced it too. My new hard drive is in the lower left side of the open computer. I had the keyboard up against the screen so I could access the parts. Again, thanks to OWC for their great install videos.